A recent sinus infection resulted my wife placing a no dust ban in the workshop. As I spend a large amount of time in the workshop building this makes life hard for me. 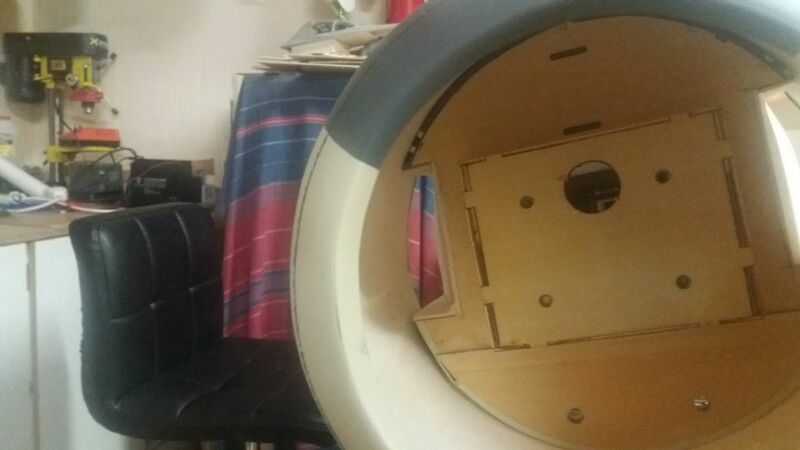 I would also not be able to continue working on the rebuild of a large World Models Cub that I was busy with as it needs a whole lot of sanding and recover in nylon and dope. 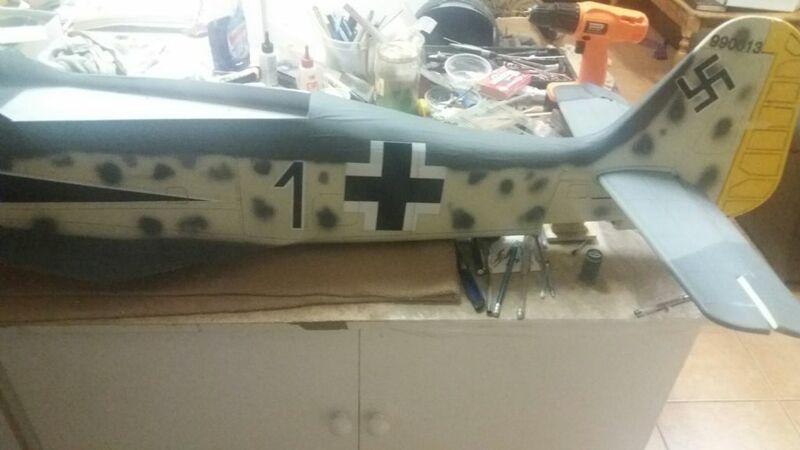 A local hobby shop helped by having a Summer special on Kits with great discounts and I decided to test the credit card and bought a Seagull FW190 that I would use to improve my detailing on film and also more importantly practice clear coating as this is a art especially when using a matt clear coat. I have built a few Seagull kits this year and am impressed by the build quality but have found that often need a few changes to improve scale appearance and flying characteristics. 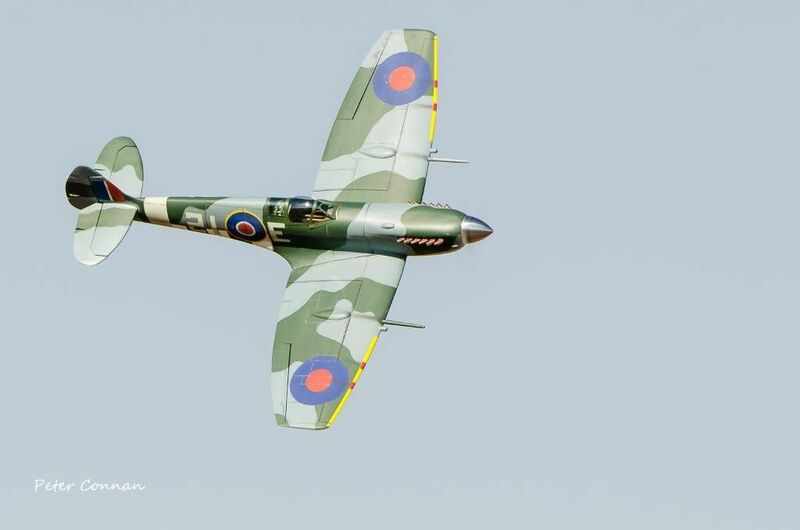 I am not a scale competitor but like a realistic aircraft, this is my Mick Reeves 1/6 Spitfire that I built. 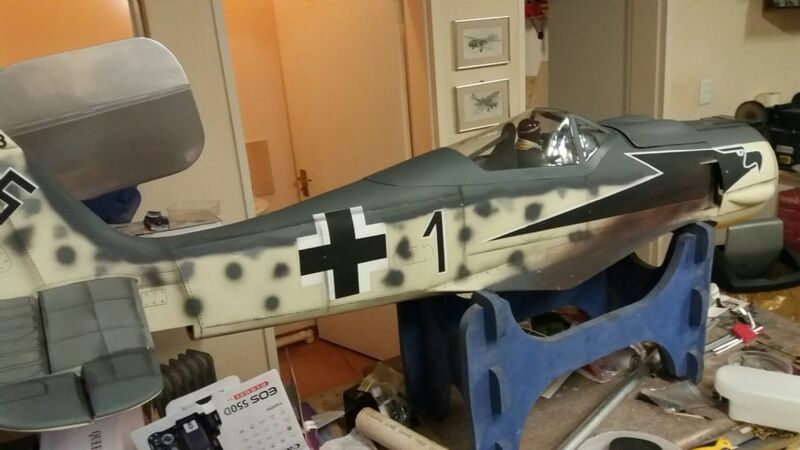 The FW kit showed a very well build airframe that was covered well but in an unusual colour scheme that needed some help! Engine cooling would be a problem as the fuselage did not have the scale outlets behind the cowl. 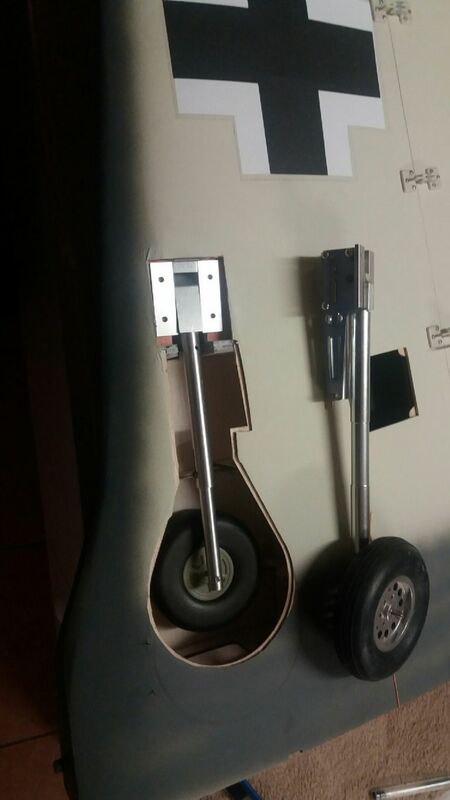 The supplied retracts would also be a problem as the units are 90 degree retracts and a wedge was built into the wing to have the inward canter of the real 190 but this results in the retract being at an angle in the wing so the supplied wheel doors would not fit. The wheel was also very small and the oleo short giving a very strange look on the ground. 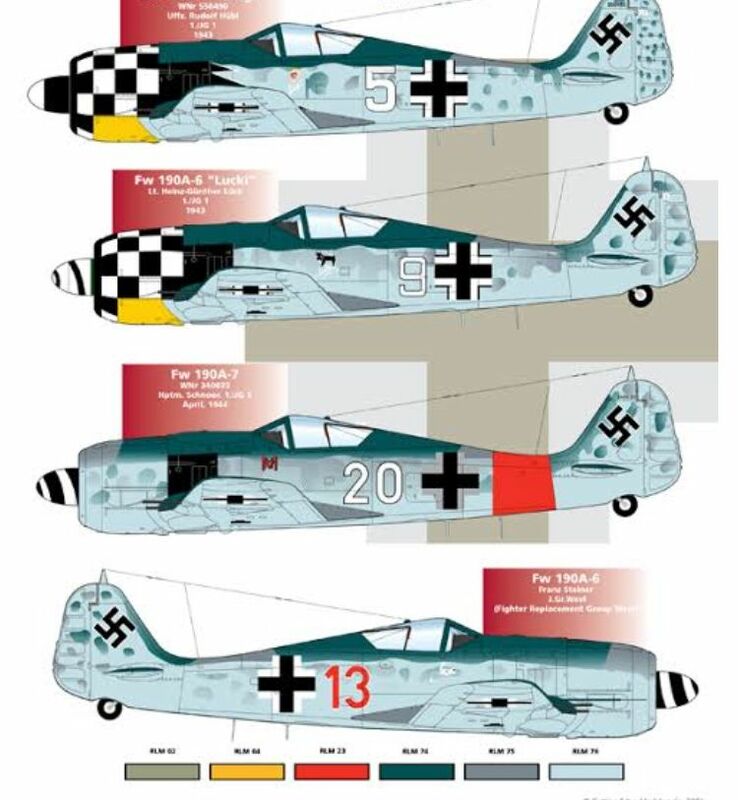 I have a spare set of ESM/ YT FW 190 retracts that I will be using on the model so I will have to change a few things to get them to fit. 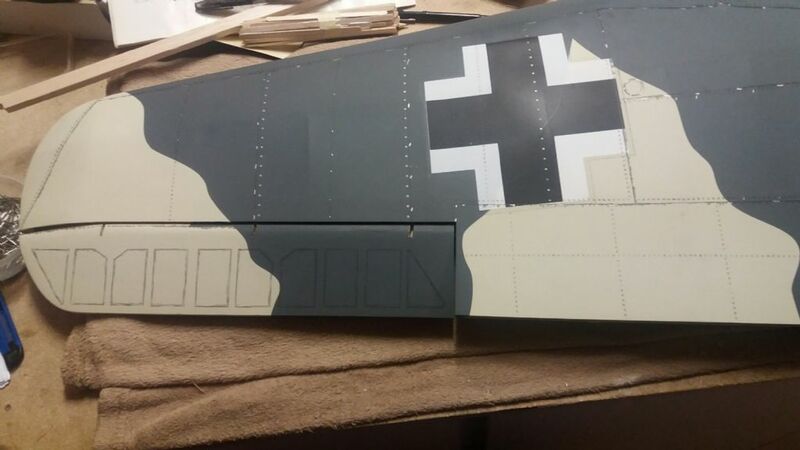 I made card board templates and used them along with ink pens so that I could draw some detail onto the airframe. All very smoke and mirror stuff, but I think it will add a lot of appeal to the finished product. I always seek to enhance any artf's i build. I just cant build them totally stock, i have to alter something! I decided to try and add some colour to the upper surface of the wings as the supplied scheme was not what I wanted. 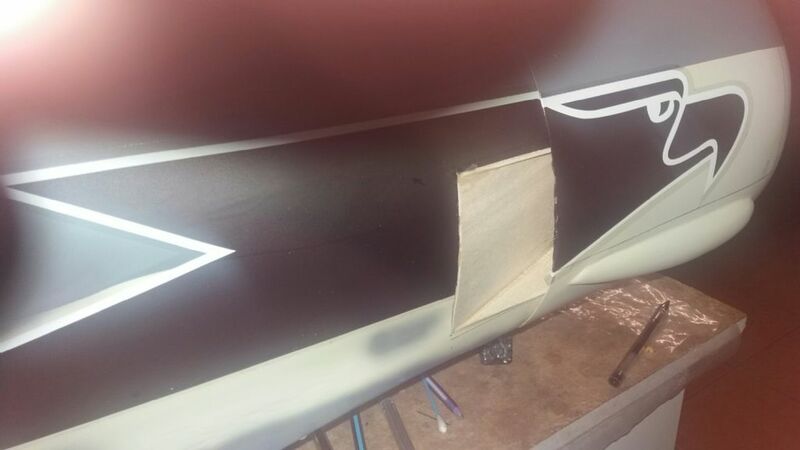 You have to wonder why a lighter grey was not used when the original covering was done as Seagull have stock as it is used on the mosquito. I also then did a little work on the fuselage to break the hard lines between the colours and am happy with the result . 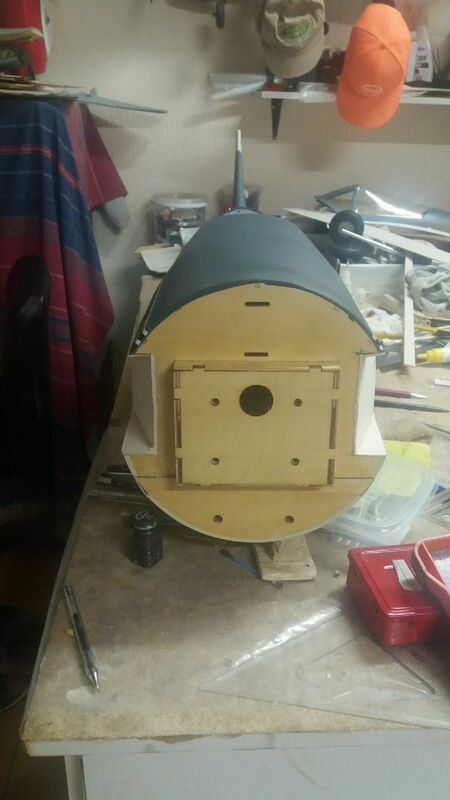 The cooling duct has been added to the fuselage, will make a huge difference to the amount of air passing through the cowl. I wonder why it was not added when the fuselage was made as round cowls are problematic with engine cooling as the exit size must be bigger than the inlet. Having a 'no dust' decree imposed is disastrous for a builder. How about constructing a simple extraction system? nothing too elaborate, but good enough to take the worst away. I use an old hoover and cardboard box - sounds a bit Heath Robinson, but it works. Use it with a decent mask. Do you use Permagrits? They don't produce anywhere near the levels of dust as abrasive paper. Hope you find a solution. The no dust decree Will be lifted as soon as the sinus infection clears. Staying in South Africa has advantages and disadvantages but Spring is traditionally a tough time of year with lots of dust and pollen which is a bad combination. We have not had very little rain in 5 months but are due for good rain in the next week. I normally do all my sanding and dope work outside as we have a fair size garden that allows for a gazebo and table to be placed on the grass under a tree. Summer temperatures are around 30 degrees mean it is easy to work outside. Permagrit tools are great but not freely available in this country, I use normal sandpaper for most of the sanding. Progressing slowly, we have had a heat wave with temperatures reaching 36 c so more effort needed to complete anything. Just need to install a throttle servo and push rod , tank and the final hook up of controls. I did add some bits to the cockpit area to fill the empty space. Starting to look like a 190 now. 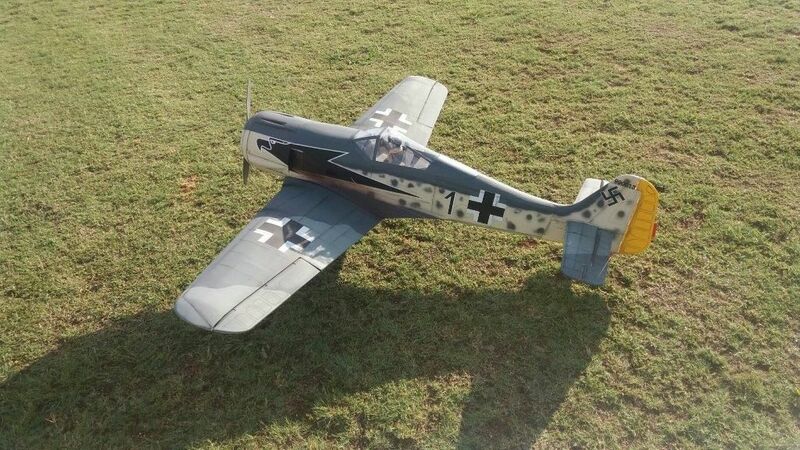 I have now had 4 flights with the FW 190 and am happy with the overall performance of this aircraft. The amount of lead required to balance is more than expected so the aircraft is not light. My son did the initial test flight and found that down elevator was needed and you must allow speed to build before take off with a flat climb out as it will pull left under power at slow speed. The elevator is not as precise as I would have expected and takes a little time to get used too, almost feels tail heavy without the trimming issue. 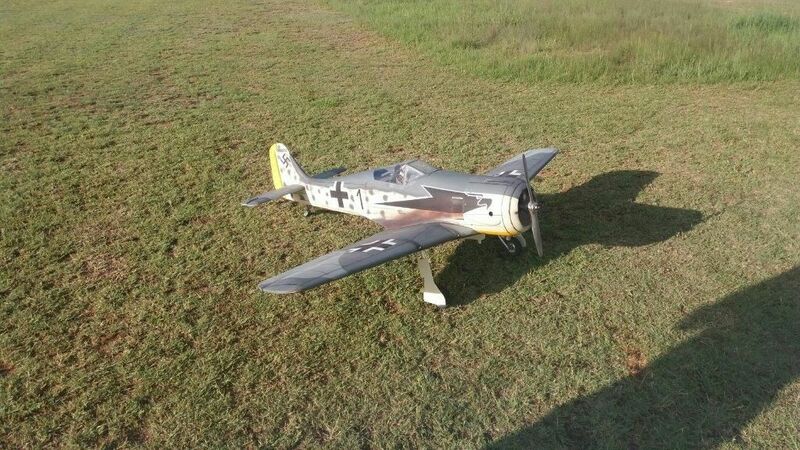 Landings are fine and the approach with flaps is steady with no elevator compensation required. My cg is at 145mm. I want to add a dummy motor as the ST 3000 is running a little hotter than I would like but has not given any issues. 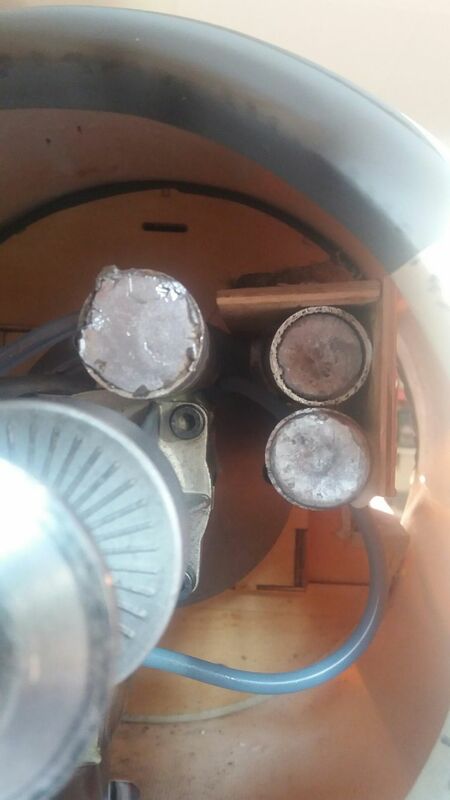 It starts first flick and has not had the needle valve touched in 3 outings. I love the look of this air craft in the air but do not have any decent flying pictures. 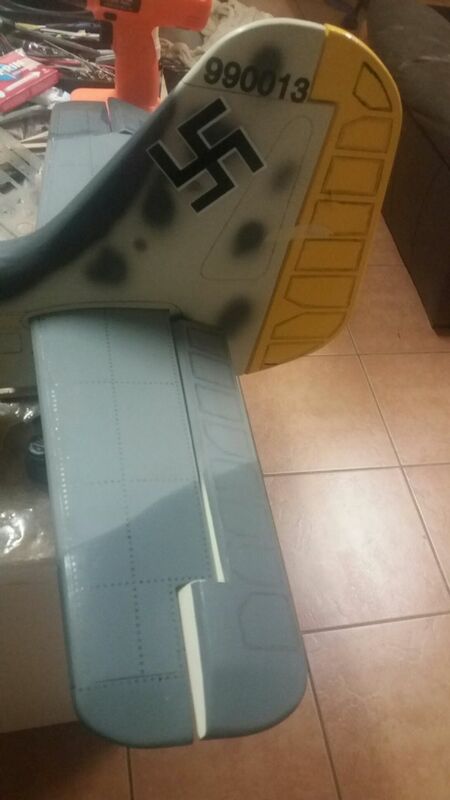 I received my seagull fw190 recently and will start the build very soon. I will be using saito a FA325-5 cylinder raidal for this model. 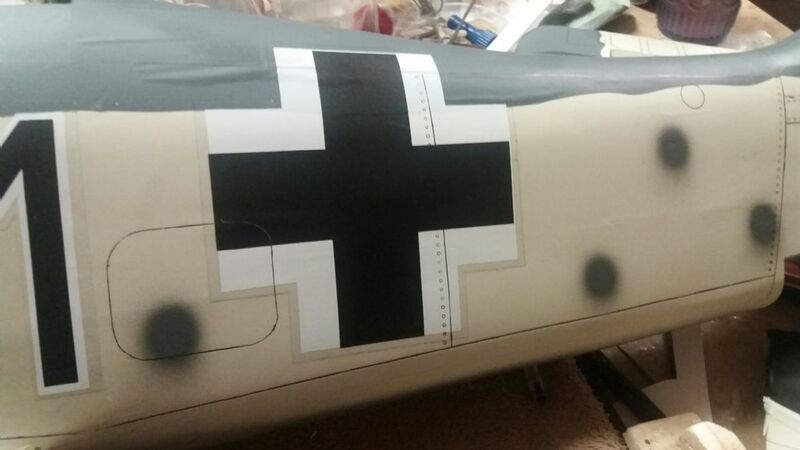 I am planing to do all those mods, even i am thinking about changing the beige-like color with light grey or blue, checkeredboard paint on cowling, 3d print a proper, scale looking spinner (i got 3 blade props) etc...I dont have longer struts but i will find some suitable ones. 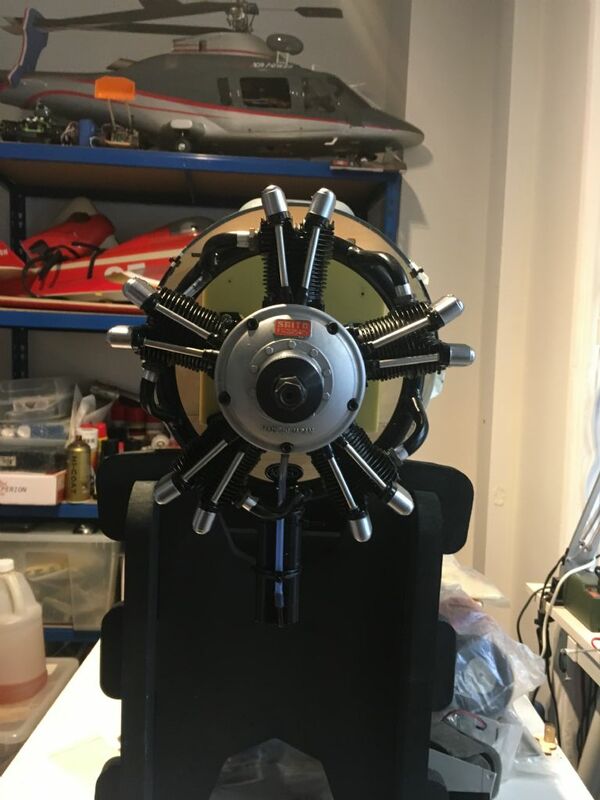 Saito FA325 is 2.4kgs weight so i am not sure if i will need any extra nose weights also i am a bit worried if the motor mount can carry this weight or should i extra strengthen the woods. So any info/advice about the build, CG etc. will be much appreciated. If you have more photos or videos, i would really like to see them. Can you please tell me the weight of yours without gas ? 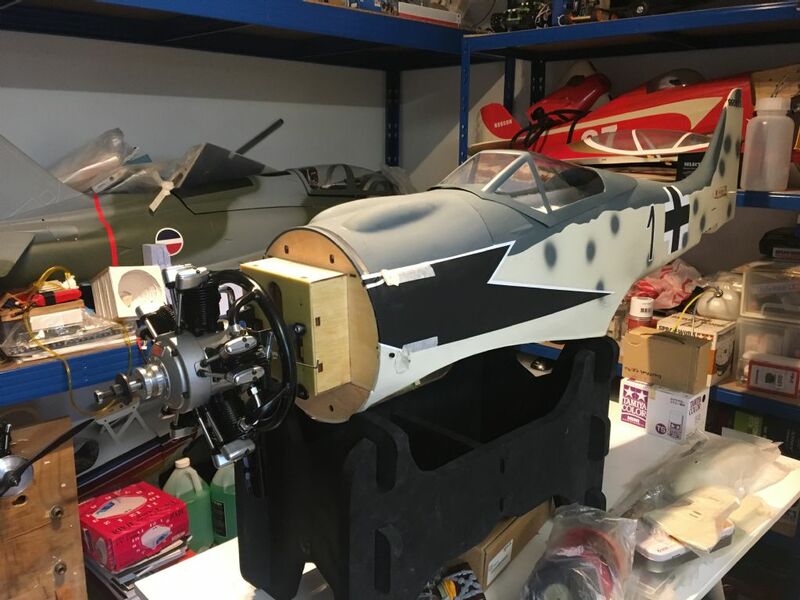 Nice project and motor that you have for it. I have found the painting worked out better than expected and I am sure that you will be happy with the results. 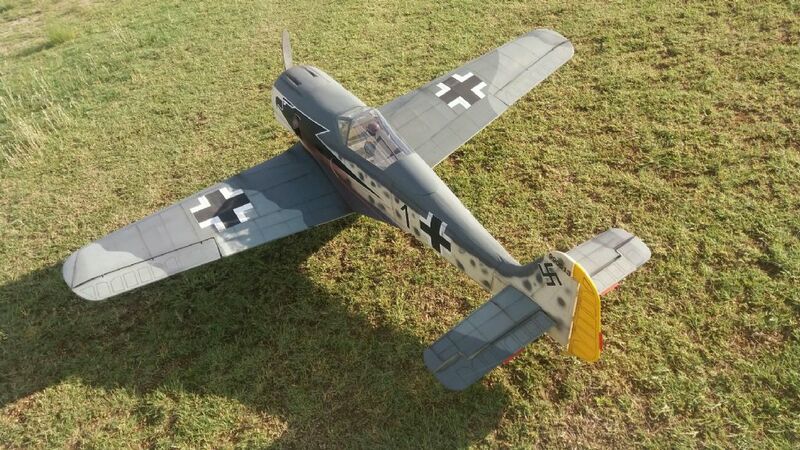 The FW flies very well and is quite stable in the air, mine needed down trim and I would suggest that you add this before the test flight as the first flight it took off at a lower speed than it should of and behaved in tail heavy way until the speed had increased. My son did the flight and has good fingers and nerves so it was well controlled. I tend to allow plenty of speed to build before climbing. Approach is stable with no elevator trim needed with the flaps at low throttle. 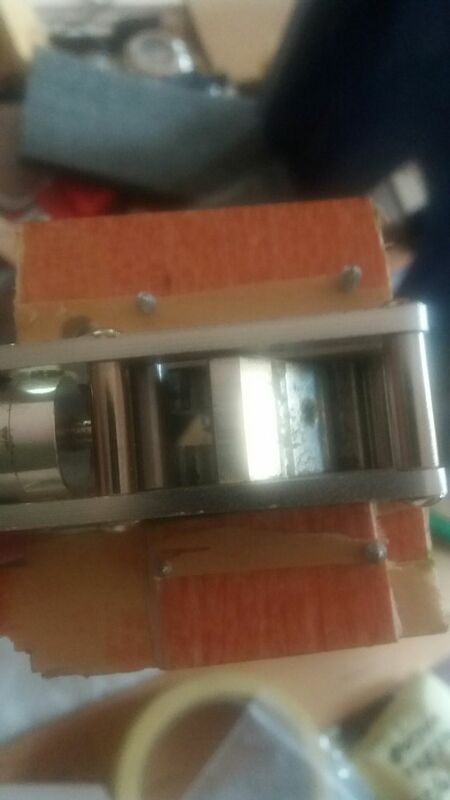 I would add 3 mm dowel pegs to strengthen the firewall joint as mine almost came out after a fast landing and the landing gear ply delaminated resulting in the gear folding. This was very dissapointing as it was not a bad landing. Could be that this was a early kit and has had improvements since then. I used lots of epoxy reason to strengthen the undercarriage area and drilled 1mm holes in the ply plate and then soaked with cyno. 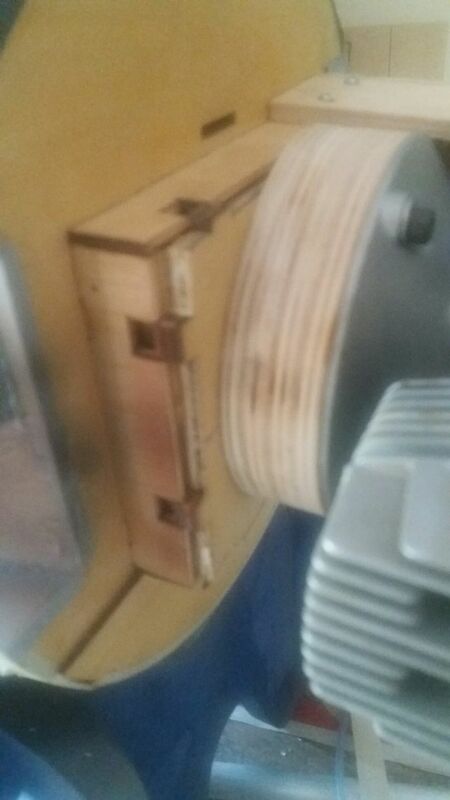 I also used longer wood screws and have not had any issues since this was done. I needed a lot of lead to achieve the balance point of 146 mm from the leading edge and it could even be a little forward of that. I did not weigh the finished product but other than the lead it should not be mush more than the standard kit. You wrote some useful tips, very helpful. When i checked your photos, i can see there are some differences between models on the firewall and retracts. Probably our models are from different batches as you mensioned. I learned from seagull campany that mine is produced at november 2018 so maybe they improved the model as you said. But anyway i will check and try to modify the strength of firewall and retract slots. -Which servos did you use for elevator,aileron and flaps ?